In the United States there is one trained pastor for every 250 people. Around the rest of the world there is one trained pastor for every 450,000 people! 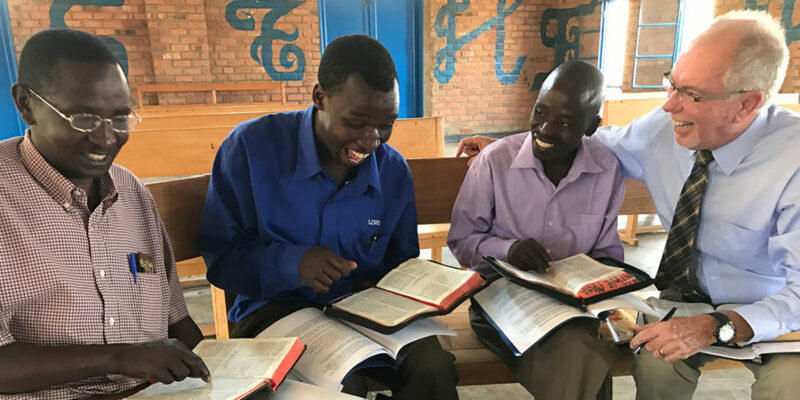 Pathways Africa is a slow, steady, relational ministry training pastors in Africa who will train other pastors how to study and preach God’s Word. Working with groups of about 16 pastors who otherwise have little access to training, we model, teach, and practice basic inductive bible study tools: keeping our finger in the text, observing what the text actually says, asking good questions, understanding the near and far context, structure, genre, application, and more. We train pastors in Africa to grow in being workmen approved by God, correctly handling God’s life-giving Word, 2 Timothy 2.15. Working alongside another trained pastor from the United States or Great Britain, we hold 9, week-long workshops in Africa over three years with the same group of 16 pastors who are then simultaneously training other pastors how to study and teach God’s Word. By being with the same pastors over three years, we build deep relationships that allow us to come alongside one another, speak truth into one another’s lives, challenge, pray for, encourage and grow in grace together. Please read more in my blogs, pray for us and consider investing financially with us in training pastors who train pastors.